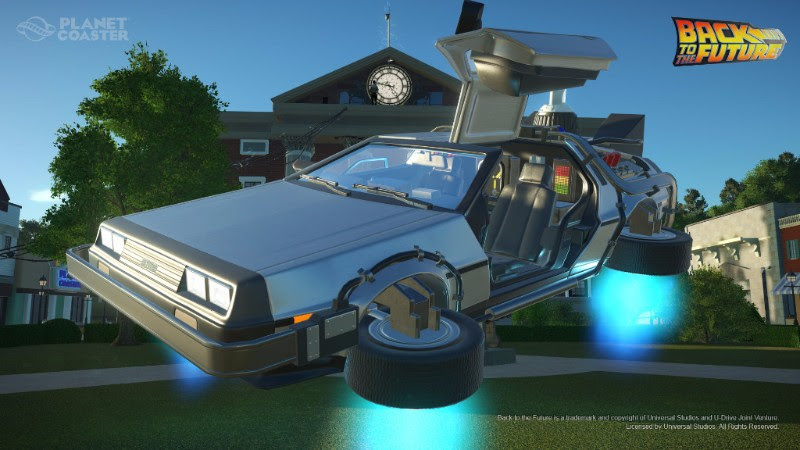 Frontier Developments has been on a roll lately with Planet Coaster (our review here), their recent free Summer update (our thoughts) celebrating the 4th of July in style by adding a wealth of awesome features including a trigger system control panel, screens that give you the ability to add video to your park, and even fireworks! Well, today they’ve got some cool new updates representing their first foray into the paid DLC market. If these three are any indication of the quality of future DLC packs, there’s a lot to be excited about. The content packs reach into my childhood (and a little beyond), featuring K.I.T.T. and K.A.R.R. from Knight Rider, the DeLorean Time Machine from Back to the Future, and the DRAG-U-LA dragster Munster Koach from The Munsters. All of these vehicles will be added to the new Construction Kit downloadable pack area, giving you piece-by-piece construction components to build each of these vehicles at large scale, medium scale replica scenery pieces, and even small scale to add to your go-kart tracks, with branded logo signs pre-built and ready to go.